“Tonight’s the night,” A young red fox thinks as he looks through the bars of his cage. “We are springing out of this joint. The plans are all set, we just need to wait a few more hours until nightfall when there are fewer workers around.” The cunning fox had crafted a master plan to break out of the zoo with a few of the other animals. He glances over at an otter swimming in her pool and nods. “Alright, Patty is ready.” He thinks. Then he looks over to a tortoise lying asleep on his grassy knoll. The fox rolls his eyes. “If Frank slows us down one time, we’re leaving that overgrown turtle behind. I’ve worked far too hard crafting this plan to let him ruin it.” As he finishes his thoughts, he hears a zoo keeper’s footsteps. “Quick Remy, act asleep so the zookeeper doesn’t suspect anything.” Remy the fox thinks as he runs over to the spot of bare earth where his normal nightly sleeping has worn the grass away. He lies down and closes his eyes. The keeper looks inside at Remy, like normal, and starts to walk away. Suddenly, she steps back and begins investigating closer in the cage. She isn’t just checking out the cage, she’s looking right at Remy! The fox is peeping through his barely open eye lids at the keeper. “What’s going on?” The young mammal thinks, “Has she discovered my plan? Did that good-for-nothing Frank turn me in? Either way I need to keep my eyes closed so she thinks I’m sleeping.” Remy closes his eyes to quell the keeper’s suspicion. After what feels like eternity, Remy peeks back through his eyelids. The keeper is still there! Quickly Remy shuts his eye lids again. “How long is she going to be there?” He thinks. He closes his eyes again but keeping them closed for so long has begun to make him sleepy. He yawns as he lays waiting for his chance to spring his plan. Moments go by and he eventually drifts into a sleep. “Hey Remy!” A voice echoes in his ears while he sleeps, “Remy get up! It’s time!” Remy is woken by the sound of Patty’s tail slapping the glass at her exhibit that lets the visitors see her swimming in her pool. Remy rises quickly to his feet and runs over to the gate to his cage. “Alright Franky!” He shouts, “Just like we planned, push the rock over to your fence and climb out!” He looks over to see that the large reptile is still fast asleep in his grass patch. “Errr!” He growls, “Frank!” There is still no response from the turtle. “I got this!” Patty says. Remy looks over to see the otter swim to the bottom of her pool, then dart to the top of the pool at an almost impossible speed. She swims so fast that she shoots almost twenty feet over the glass wall! She spins and gracefully lands outside of her exhibit. “I had no idea you could do that Patty!” Remy exclaims with a look of shock on his face. “That’s awesome!” Patty smiles and then runs over to Remy’s exhibit gate. She leaps up, clings to the gate, and sticks her claw into the lock on the gate. “You never asked me you silly fox.” She says as she chuckles. In a couple of moments she has the lock picked and the two are free from their cages. As they begin to head toward the zoo’s front gate, Remy makes a realization. “Frank.” He says as he turns back to run toward the sleeping tortoise’s exhibit. He runs faster than he has ever ran. The cages seem to blur as he blazes past them to wake his snoozing friend. Remy screeches to a halt just outside of the reptile’s fence. “Frank! Wake up you lazy,” he stops his sentence as he begins to look for something to wake the turtle up with. Remy notices a nice sized rock on the path by the exhibit. He reaches over, grabs it, stands up, and launches it at Frank. His aim is terrible and the stone bounces a couple of yards away from the tortoise. Remy puts his paws to the side of his snout and yells, “Frank!” Then he pauses. He looks down and notices he is standing on two legs, “How?” He says as he looks around to realize he is using his paws to grab and throw things. “Here use this one.” Patty says startling the young fox. He notices she is also standing on two legs and she has her paw extended with another stone in it. “Am I missing something?” Remy asks. “How long have we been able to do this?” The otter looks back at him and chuckles. “Silly fox. Wake Frank up.” Remy takes the rock from Patty and focuses really hard on the tortoise. Remy knows that one of the zoo keepers will be making a patrol pass soon, so this rock had to do its job. After careful concentration, he throws the rock and hits Frank right between the eyes. The startled turtle raises his head and looks around to see what hit him. “C’mon Frank. We don’t have time to mess around.” Remy enthusiastically exclaims. The tortoise looks up at the fox and nods his head to acknowledge him. Then begins to close his eyes and lay back down. “Frank!” Remy yells. “Ok, ok.” Frank says as he stands to his two back legs. “Let’s go.” Remy says to Patty as the two get back on all fours and turn to run. Frank pulls up his shell and begins running awkwardly. He stops and hops over the fence to his exhibit then continues to hobble behind the other two. They run through the park toward the exit ducking and hiding as keepers walk by. “I don’t know how they haven’t seen you yet, Frank.” Remy chuckles, “It’s hard to miss a five hundred pound tortoise.” He looks back to notice that the turtle is panting from exhaustion. Frank sits back on the stones lining the walkway they are running down. “Look Frank,” Remy snaps as he stands back on his two legs and points at the giant reptile, “We’ve been talking about this for months now and you were ok with it until now. We agreed that we have never seen the world outside of this place and we are getting out of here to see it.” The fox looks around to make sure that no trainers are around. “Frank! Are you listening?” he whispers loudly. Frank has his head hung over his shell and he is fast asleep. “Ugh! This turtle is going to get us caught!” Remy exclaims. As he finishes his words an alarm begins to go off. The loud sound wakes the Frank up and the three lay low to the ground. “Listen Frank. If we get out of here, you can have all of the green lettuce you want. You don’t have to wait for the trainers to feed it to you.” Remy reasons. “Yes,” Remy says hurriedly, “But we have to get out of here first.” The turtle jumps to his two feet and takes off like a rocket past the two mammals. Remy has an astonished look on his face and turns to look at Patty. She looks back at him with a look of concern. “Well. Let’s go!” she says to the stunned canine. Remy shakes his head and the two begin to dart toward the front gate. As they approach the front gate, they see that the way is blocked by the head keeper. “Man, we’re caught!” Remy exclaims. To his shock though, Frank jumps into the air, retracts into his shell, and begins spinning. He hits the ground with a skid and launches toward the zoo keeper. The keeper looks much larger to them when they are out of the cage; in fact he almost looks like a completely different person. He’s usually short and scrawny. He now looks like a giant with large muscles and a beard. The large keeper is no match for the giant tortoise though. Frank slides into the keeper’s legs, tripping him, and sending him falling to the floor. Frank doesn’t lose momentum and smashes right into the gate, sending it flying open. The turtle jumps into the air, comes out of his shell, and keeps his pace as he runs. “We did it!” Patty exclaims, “We are wild animals now!” They run past the now-dozing zoo keeper and as they leave the zoo gates, seven police swat cars show up. The large vehicles slide into place and police poor out of them ready to take the animals in. A helicopter lowers over them, and the wind from the blades blows their fur as well as everything around them. Remy looks around in amazement. Why would they send a swat team to retrieve three animals from the zoo? More importantly, how was his group going to get out of this? “Remy time to eat!” A policeman shouts from the crowd. 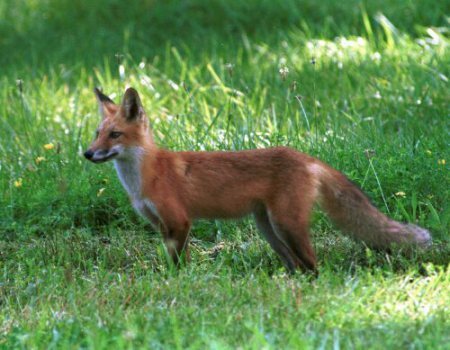 “Remy!” The fox is astonished. He looks over to Patty to see if she is as shocked as he is. She is looking at him with no emotion and she is now shouting at him. “Remy breakfast!” She yells with a strange man’s voice. A loud clang of Remy’s food bowl startles him. He looks around to see that he was still lying in his cage. “A dream?” Remy thinks. “All of that was just a dream?” He looks at his caretaker with disgust. He dashes over to the bars of his cage and peers through to see if the other two had escaped. Patty is swimming happily in her pool, and Frank is chewing lazily on some fresh lettuce. “Hey, jump out of there! Come let me out!” Remy tries to yell to Patty, but it only comes out as a bark. She swims up to the glass and looks at Remy in confusion for a second. Then she casually swims away and begins to play again. In disappointment, Remy walks over to his bare patch of earth. He looks around at his cage for a moment and plops back down. “Come on now little guy.” The trainer says as he fills Remy’s food bowl, “It’s gourmet chicken flavor, your favorite.” He dumps the food into the bowl and glances back at the sad canine. “Alright, well it’s here when you’re ready.” The young man say as he walks out of the cage and locks the door behind him.